Myelin, which insulates nerve fibers, contains only 18% protein and 76% lipid. 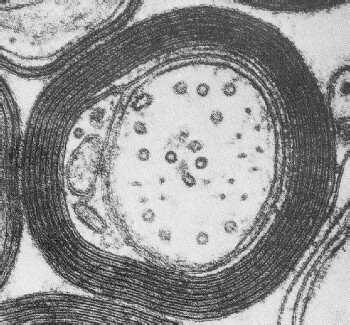 A electron micrograph of myelin is to the right. Mitochondrial inner membrane contain 76% protein and only 24% lipid. Plasma membranes of human red blood cells and mouse liver contain nearly equal amounts of proteins (44, 49% respectively) and lipids (43, 52% respectively). Considering what you already know about these cells or organelles, what would be the significance of these different proportions of lipids and proteins? As we said above, membrane architecture is that of a lipid bilayer. The lipids are amphipathic in that they have hydrophilic polar heads pointing out and the hydrophobic portion forming the core. Proteins are embedded in the bilayer. 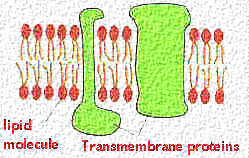 They may pass through the bilayer ( as transmembrane proteins), or they may be inserted at the cytoplasmic or exterior face. A cross section of the bilayer is seen in this figure. As we will see in more detail below, the lipid molecules have a globular (polar) head and a straight region (non-polar). Each row of lipids is a leaflet. 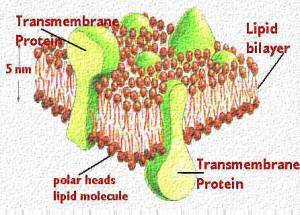 Therefore, the plasma membrane consists of two leaflets with the non-polar regions pointing inward.